This week Lisa speaks with Samantha Smith, who joins us to talk about what it’s like to create an amazing culture at your company. She gives very specific examples of ideas you can implement, no matter what your current title is. Unlike our usual audio-only interviews, this one was onsite at the Jobs2Careers headquarters in Austin, Texas. You also get a bonus interview with Suong Luu. She gives the cultural overview from the employee perspective. Her first job out of college was with Jobs2Careers. She has already progressed through several roles from intern to marketing coordinator. And she has been able to experiment in functions from IT to marketing. If you go to the J2C homepage for job seekers you’ll see roles in tons of industries, locations, and companies. Check out their careers page to explore their open positions inside of Jobs2Careers in Austin, TX. Keep in mind, even though they’re a software company, their workforce is onsite in Central Texas. Working together in the same location is actually part of their secret-culture-sauce. Finally, if you’re a hiring manager, you might be interested in the J2C For Employers page to check out their unique Pay Per Application model. Here’s the live interview with Sam and Suong on camera. Lisa Cummings: [00:00:08] You’re listening to Lead Through Strengths, where you’ll apply your greatest strengths at work. I’m your host, Lisa Cummings, and I gotta tell you, whether you’re leading your team or leading yourself, it’s hard to find something more energizing and productive than using your natural talents every day at work. [00:00:50] And, you know, I was so disappointed. I opened this thing up and, as it describes each of these award-winning companies, it gives some bullet points on what they do to make their culture great. And do you know what the answers are? Oh, gosh, let me give you a sampling. Number one: generous retirement plan. Number two: charity involvement. Number three: rewards program. And number four of your sample: a health and wellness program. [00:01:19] Oh, my gosh, I was so bummed out when I read those, because I thought it would be full of inspiration and ideas, and although those bullet points are fine enough words, it’s just like when you see on a resume when someone says they’re a motivated team player. It’s like, “Well, yeah, that’s the same thing everyone else is saying. Give me something different. Give me something specific and inspirational.” It was lacking all of the telling details. And that led me to the idea of what the next couple of interviews are going to be about. [00:01:48] Today you’ll get one of several episodes I’ve recorded that gives you specific examples straight from leaders who have built an awesome company culture. 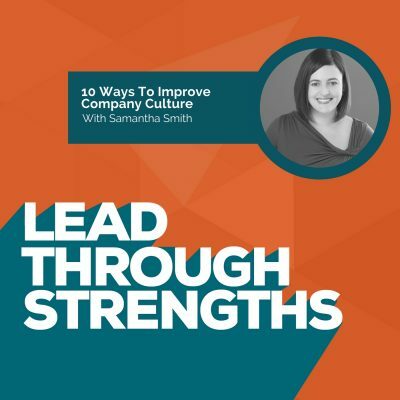 There are so many direct ties between strengths and employee engagement on your team, so you’ll get this peak behind the curtain at workplace cultures that can give you an inspiration to come up with your own ideas that are riffing off of the one you’ll hear here. [00:02:14] The bulk of today’s interview was recorded on site at a company in Austin, Texas called Jobs2Careers. So you’ll hear us also refer to this company as J2C. Of course we’ll link J2C in the show notes so you can check them out all the way. [00:02:32] Now this show highlights Samantha Smith who runs their marketing team. And then in the next episode you’ll hear from their CEO and from their Head of HR. That way you’ll get specific examples that are unique from each angle inside of the business. And at the end of this episode, you’ll hear a recap about how Sam’s examples fit right into our RAMP model for nurturing team culture. [00:03:00] So as a quick teaser, the four RAMP factors to always be nurturing on your team are R relationship building, A accomplishment, M meaning and purpose, and P positive interactions. So RAMP makes it an easy acronym to think about your culture. [00:03:19] You’ll hear the tone of the audio change a bit as we move over because it was an onsite recording, so if you do want to see the full impact, with video, you can also watch this interview portion on the show notes page. Just go to LeadThroughStrengths/SamanthaSmith and it has everything except for that recap at the end. [00:03:38] So, with that, let’s jump over to the onsite interview. [00:04:07] So, no matter what side of that fence you’re on, you get to see lots of different angles at J2C. And I’ve been Jobs2Careers but J2C. Is that internally your name? Samantha Smith: [00:04:18] Internally that’s the slang. Lisa Cummings: [00:04:19] Yeah, that’s your slang. And you have to have team slang to have a team culture. Lisa Cummings: [00:04:24] So what’s your favorite thing about culture here? Samantha Smith: [00:04:26] I would say that we try and do things differently. We’re very opposed to, “Oh, we’ve always done it that way.” And one of the things I like is that Bruce (Ge), our CEO, and management team really want to hear what the employees have to say. I believe that Bruce’s philosophy would be that you hired good people and that the success of your company is mostly dependent on your team. [00:04:48] And one of the things that I like is Bruce does a CEO Circle program. And what that is, is every quarter he will give us a business challenge that he’s facing. It could be what to name a new product, or it could be how to brand us in a creative way, and it has to be easy to implement and inexpensive and solve a problem. [00:05:08] And every quarter somebody wins it. Three people, actually. And when you win it, you get to go to a family event with Bruce and his wife and two kids, you get a $1,000 bonus, and you get a chance to implement your program. And one of my favorite examples is our social ambassador program, and that was the answer to a question of, “How do we maintain our culture as we grow?” because we’ve just about doubled employee headcount year-over-year for the past four years. So how do you keep the culture of a small company when you get big? [00:05:41] And so the social ambassador program is run by one of our client success analysts, and basically when there’s a new person that starts, it’s you get a schedule to have lunch with a new person. So they get to have lunch with somebody from a different department every day so it’s not you’re just going to a lunch. Here’s there’s 80 people like that you don’t know exactly. Samantha Smith: [00:06:06] Yeah, exactly. And so we don’t want anyone to feel that way, and we want them to know us, and we want engineers and marketing and sales and HR to all eat lunch together and not get too cliquey. Lisa Cummings: [00:06:16] Oh, I like. And when you first said it, I’m thinking, “Marketing,” I’m thinking, “Social,” as in social media, so I expected your answer to be about something to the external world. I love hearing that this is an internal, how you get to know each other and work with each other. Samantha Smith: [00:06:31] Definitely. One thing I thing is cool is that when I started with Jobs2Careers we had 40-some people, and now I think we’re 90 plus. And I think I still pretty much know everybody’s name, which I’ve worked with companies much smaller I can’t say that about. Lisa Cummings: [00:06:48] It says something about people really caring about each other and you can’t make somebody care about each other. What are the things that happen here that allow that environment to happen? Because I could certainly see that in a room of essentially every employee, there are really deep relationships that you can tell it’s different from those who, “Oh, that’s that guy in accounting who I don’t know.” Now how does that happen here? Samantha Smith: [00:07:14] It does feel different than other places, and I’ve thought about why. And I think a big factor is that we all eat together every day, and every afternoon at 3:30 we have tea time which is a 20-minute break to not let your blood sugar dip too much, and you have to mingle outside if it’s nice with people in other departments. [00:07:33] And so we really all do know a lot about each other and that helps when you need to ask for someone’s assistance with something, or somebody comes to you. And it also helps that we know what everybody does because sometimes we’ll talk about work at lunch and people know what everyone’s role is. It’s never like, “Oh, I don’t know who you are. What do you do?” That doesn’t really happen. Lisa Cummings: [00:07:58] Right. So when you were talking about the CEO Circle – did I get the terminology right? [00:08:31] Then there’s the other side of branding that the typical marketing person would be focused on – your company brand and the brand personality traits. They seem very aligned here. So how does that all come together from your perspective? Samantha Smith: [00:08:42] Well, our mission statement is, “Innovating the way employers effectively find talent, and the talent effectively find employers.” So, we’re helping both sides of the coin there. And there’s the key word of innovating, which is that we want to do employee branding differently and we also want to do searching for a job and hiring differently. [00:09:03] This company is only five years old, so it’s not a legacy brand that you have to give a facelift to. We could start something new and it wouldn’t affect any existing business. And even, for a simple example, expense reports, they’re really easy to do. We’ve got software to do them. It’s not a lot of cutting and pasting and it works quickly, and that’s just an example of something that doesn’t get bogged down in red tape. Lisa Cummings: [00:09:30] And if you’re going to make simplicity a key part of your mission statement you want to live it out and model in everything you do, and you really do it. Samantha Smith: [00:09:38] There is efficiency all the time. Even as simple as dishes are piling up next to the sink. Let’s put a basket there if the dishwasher is full. And it sounds silly but in a big office little things like that help. Lisa Cummings: [00:09:53] And I would imagine they would start to be the small things that create a culture because just like when you walk into a public restroom and you see trash all over the place, similarly if you start to see dishes all over the place then people don’t care about the space as much. And so coming up with solutions for things and being efficient and being simple, it does feel like it’s really built into what you do here. Samantha Smith: [00:10:16] It does. Lisa Cummings: [00:10:17] Another thing we’ve talked about outside of the interview is perks. Let’s actually talk about some of the perks you actually have, because this is a typical go-to for culture. People go, “Okay, it’s a tech company. Let’s make some cool company perks. Those do attract people, and it has to go beyond that.” So talk a little bit about what perks you do have. You’ve mentioned lunch every day. Samantha Smith: [00:10:40] Yeah, that’s pretty good. Lisa Cummings: [00:10:41] And tea time is pretty cool. What else, and then how do you go beyond that? Samantha Smith: [00:10:46] Well, we have everything we need here. We have lunch, we have tea time, we have coffee. Its purpose is to make us work more efficiently. So we have everything we need, and we don’t want for anything here. But I would say that beyond the perks, there’s the cultural perks too, like to always learn and to try new ideas and to communicate. [00:11:08] And one of my favorite things that Bruce says is to allow for interruptions. And so what that means to me is like a C-level officer, you can just go in her office and ask them something. And if somebody comes to you, it’s sort of the same expectation. So really being transparent, I think that says a lot about our culture beyond, you know, we have a ping pong table and we have a beautiful office space in the hill country, and we see rainbows out there. Lisa Cummings: [00:11:37] That’s a great view. Lisa Cummings: [00:11:43] Like every Friday? Samantha Smith: [00:11:44] Yeah, mainly. And so there’s these moments, like, “Well, we’re really well taken care of.” But I think the part that I feel luckiest about, is that I work with such a smart group of people. I mean, the process is rigorous to be hired here, but it’s worth it because there are no weak links, and it’s really amazing to work that way. Lisa Cummings: [00:12:05] That makes a big difference in culture. Let’s end there with a little more specific look at people and how they come into the role that they’re doing, and even how work is assigned? So something I noticed, for example, working with Callie that she’s just so energetic. It seems like everybody I interact with, they love what they do. [00:12:28] And it’s not just I want to make the cliché comment about passion because I feel like there’s a lot of explanation that needs to happen beyond that, but the energy that people bring. What happens from you being a people manager when you’re trying to imagine, “How do I take this person, know their skills and interests, and align them to what puts them at their best so that kind of energy connection show up at work?” Because it’s showing up all over the building. Samantha Smith: [00:12:54] Well, one thing that’s neat about how fast we’re growing is it gives you room to change your job. For instance, we had an account executive who became a sales manager, who then became a sales operations manager; we’ve had people transfer departments. And so because we’re growing so quickly, these new avenues open up, and if you really jump on them and own them, then you can have that and then somebody else will do the other part. [00:13:20] So everyone is passionate because you’ve kind of get to choose your job to a certain extent. There’s always support from management, but there’s not necessarily, “Okay, this is what you need to do every day.” So when I started my job nobody told me, “Okay, so for marketing materials, we’re going to focus on doing case studies, and doing content marketing, and get our blog redesigned.” No one told me that. It’s just you see a need and you go for it and then you see that there’s value to it. If you go into your manager’s office and have an idea that’s going to bring value, they’ll let you do it. Lisa Cummings: [00:13:52] Yeah, I love it. We have a lot of listeners who are at tech companies and that’s an environment they’ll be able to really touch and feel. And then, I also have a lot of listeners who work for big companies and add maybe a couple or a few zeroes to the headcount. If, for that person, just to go out on an idea of what could they do so it’s going to feel more bureaucratic, a little less able to just say, “Oh, my gosh, I can craft my job”? What advice would you give for somebody who’s a manager at a company where they’re a little more mature in the business so things don’t change as fast and they’re trying to blaze a trail as a manager and create their own team culture? Samantha Smith: [00:14:34] I would say don’t underestimate the power of going out once a quarter for a department event. We just did that recently with marketing. We did a “Build your own terrarium,” which is a thing in Austin, and there were about 12 of us, and we built our own little plants in this jar. And we thought, “What an interesting idea, what’s that going to be like.” And it was so fun. [00:14:55] But that something that simple which just shows you care about getting people outside the office, and I think that really says it all, it’s just that you value somebody more than what they’re producing. One of, I think, the best benefits at Jobs2Careers is management training. It started with our CEO Bruce doing a management training session every two weeks and, of course, that’s how we met you. We have guest speakers once a month. [00:15:20] And there’s something about being in a room with all of your colleagues, during company time, where that’s an hour and a half or two hours where you’re not producing work for the company. There’s something about feeling that value that’s very flattering and very motivating. Samantha Smith: [00:16:08] I think Bruce sees everybody as future managers. Lisa Cummings: [00:16:11] That’s a beautiful way of seeing people’s capabilities and then letting those programs start to bring that on people. Lisa Cummings: [00:16:20] Sam Smith, thank you for the backstage pass. Yes. So to all of you listeners, gosh, wasn’t it great for inspiring ideas that you can use at your company? I promised you a recap to align the interview to the RAMP model, so you can apply Sam’s examples to your company. So let’s jump into that. [00:16:43] First, the R in RAMP is for relationships. So her first example under the relationship category is her social ambassador program. So when you’re onboarding new employees, formally link them up with someone else from the company, so that there’s a comfortable lunch buddy, some built-in networking right from the very first day. So get inspired from her idea, and think about what your version of the company welcome wagon can be. [00:17:09] Now in another example, Sam mentioned hiring great people through a rigorous process so there are no weak links in the cultural fit. So find people who will love working at your company. So to apply this in your workplace specifically, be sure you spend as much time on cultural fit, and values fit, as you do on matching their past experiences and their past skills with the role. So usually people obsess over a candidate’s background during the hiring process, yet you can actually make a huge impact on your team culture if you’ll also obsess about the interpersonal fit. [00:17:50] All right. Next in the RAMP model we have A for accomplishment. So Sam told us about their CEO Circle Awards. That was a great example you could apply at your company by creating a competition for people to come up with an idea that solves a specific business challenge. I love the business relevance of this idea. So J2C gives a monetary award, and a social event out with the CEO, and the ability to actually implement their idea. So, of course, you can come up with your own awards, make them big or small, make them work for you, but that notion of the CEO Circle award is a great one. [00:18:27] Another example she gave under accomplishment is their monthly management training. So, for them, it’s open to every single employee. I had a great time being part of a delivery team offering this training to their employees and it was highly attended. They want to show that everybody can be a leader, and there’s a dedication there to nurturing that potential and helping people accomplish their big career goals. [00:18:50] So if you think about your company, you might already have an existing leadership development program that you can just open up to a wider audience as a way to show team members that they have the opportunity to make a big impact, regardless of what their current job title is. If you don’t have the budget or an existing program, you could even setup some sort of panel interviews where you take internal executives and team members who have success stories and case studies so that you can offer some level of inspiration around that future that they might have at your company. [00:19:28] So we’ve covered R for relationships, A for accomplishment, and now we’re at M for meaning and purpose. Sam’s first example was about simplicity and innovation being part of their company mission. So they live it out in the smallest daily actions and I thought that was great, how connected the big picture and the small picture were. She even mentioned things down to the detail of the basket that would contain messy dishes, or the streamlining of expense report processes so they could live it out. [00:20:01] So to implement this at your company, think about your mission statement or your vision statement. Then, challenge each person on the team to find one small process; I’m talking tiny. One small process or workflow that seems out of alignment with your mission or vision. Keep it super small so the changes isn’t daunting, it doesn’t require approvals and it doesn’t get all bogged down. And then get it aligned so that you’re modeling your mission through just the tiniest daily actions. [00:20:31] In her other example on meaning and purpose, I’m thinking she made everyone listening drool. Maybe you feel a little jealous about the fact that at J2C the job that you’re hired to do isn’t necessarily your job for long because if you have an idea, and it’s really using your strengths, you can contribute that to the company, then you can shape your job to make the most of your talents. [00:20:51] Well, I know not every corporate culture is that flexible, yet apply her idea at work by thinking of a task, or a responsibility, that you’ve really been drawn to, you’ve really been interested in or you thought, “Oh, I would like to try that out. I’d love to spend time doing that.” And then apply that interest by spotting a need in your actual business and filling that need. [00:21:13] So if you can solve a business problem while you’re also in your zone of genius, I’m talking your personal zone of genius, then you’ll become known for the thing you love working on. So even if it’s an act of voluntarism and it’s an extra duty you’re taking on, what a great thing to build a personal brand around the things you love doing because then they’ll become the core of your job. Even in the most rigid of workplaces I’ve found that people can shape their jobs this way over the long term. [00:21:44] Finally, in the RAMP model, we have P for positive interactions. You know, Sam said it so beautifully, that notion that if you value people more than the work product, value people more than the product, it will make the work product shine while people are also feeling valued for their contribution, so you actually get both by focusing through the people. [00:22:09] In her first example she talked about the value of communication. Now they live out their version of communication by just being so transparent and open that you can even interrupt a senior officer at the company just like you do to your buddy in the cube next to you. So, to apply these concepts to your company, think about behaviors or traditions that highlight the hierarchy in your organization, the things that build walls between people. Yes, I know this sounds like opposite world, and it is, because you’re going to do something that tears down those walls. [00:22:39] So, for example, if you’re a VP with a reserved parking spot, give it to the winner of your new CEO Circle Award for a month. Or if you usually only have one-on-ones with your direct reports, go on a listening tour by holding one-on-ones with every person in your department. It doesn’t cost money, it’s just time and interest and what makes them great. Just go out of your way to connect at a human level. You don’t even have to be a manager to do this. [00:23:05] So, for example, if you’re a marketing coordinator and you have a new intern on the team, offer your mentorship. Do something that makes the line of communication seem very open and natural regardless of level. [00:23:17] Now, other examples of positive interactions were just plain sprinkled all over the interview. You heard her talk about the “build your own terrarium day” in Austin. I’m sure those are around, lots of interesting ways to do team building. You heard how they eat lunch together every day. You heard about how they break at 3:00 p.m. for tea time. And this consistent interaction with different people around the company helps them know a lot about what makes the other person tick. That gets them business results because it makes it easier to collaborate when they actually need things from each other. [00:23:54] So, now, think about your team. Can you add a Taco Monday like Jobs2Careers? Will your team take plank breaks? Yeah, like workout planks. This is something else I learned about J2C later, that their customer support team does planks together so to get an energizer. So pick something that’s small and easy to start with, just something that does break the typical pattern of interaction even if it’s three minutes a day, just something that feels like it really jives with the groove of your team. [00:24:24] Okay, so with that, you’re off to the races. Now you have at least 10 inspirations for how you can use the idea of RAMP, relationship, accomplishment, meaning or positive interaction on your team. Just pick one. Do one thing this week to nurture your culture. And this is in perfect alignment with building a strengths-based culture or a strengths-focused team. If you’re noticing what works, you’re going to get more of what works. [00:24:56] So, like what we always say, using your strengths makes you a stronger performer at work. If you’re putting a lopsided focus on fixing your weaknesses, you’re choosing the path of most resistance. So claim your new work culture and share that positive result with the world.